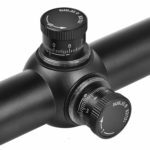 If you have been looking to purchase a good quality rifle scope, you have probably noticed the knobs on the top and sides of the scope. These knobs are called turrets. Each of the turrets on a scope has a different function and can greatly enhance your ability to shoot while using your scope. There are many types of turrets that you have on your scope, but the primary turrets are your windage and elevation knobs. The windage knobs objective is to change the impact point of the bullet by using reticle crosshairs to move up down or sideways from the true point of aim. The same is true of the elevation turret knobs. When you begin to shoot with a new scope your first step should be zeroing your scope by using your windage and elevation knobs. If you have never zeroed a scope before it is important to know how windage and elevation knobs will alter the course of your bullet. When you move the windage turret, your bullet will either move left or right of your true aim. This movement will depend on the wind in your current condition. Some turrets are designed to make an instant adjustment for windage while other turrets are not designed for instant change. More on the types of turrets available will be discussed later. When discussing elevation, it is the up and down adjustment of your bullet. Elevation turrets are typically zero to a certain distance. For instance, if your turret has been zeroed to 100 m anything beyond that will begin to cause the bullet to drop. Anything short of 100 m you will be shooting high. Understanding how your elevation turret will affect your zero and shooting in the field is vital for accurate shooting. The reason for parallax on a scope is because of the angled refraction of the image. Parallax is not unique to rifle scopes but is also found in things like telescopes and microscopes. Discovering the parallax point on your scope should not be hard as it should be dictated in your user’s guide. This is one turret that is typically not discussed; the parallax turret. The reason that the parallax turret is often glossed over when discussions of turrets come up is that it is often a fixed feature on the scope. What this means is that your parallax is often not adjustable. However, there has been a recent trend by optics manufacturers to make parallax an adjustable turret on scopes. If your fixed parallax is 100 yards, that means 100 yards and beyond your scope is parallax free at 100 yards and under you will experience a parallax. Parallax will reduce your accuracy and can cause point of impact deviations. An adjustment in your parallax can reduce the parallax anywhere from 10 yards to infinity depending on how you adjust the turret. There are several types of turrets that you can consider when purchasing a scope. Many types are standard when ordering your scope from the manufacturer. There are also aftermarket and custom scope turret’s that you can order. When considering custom turret options be sure you consult your manufacturer’s warranty before installing them on your scope. Exposed turrets are knobs that have no key or cap and are easily accessible to the riflemen. These turrets allow for on the spot modifications and are perfect for tactical shooters. Those shooters who will need to make on the spot corrections will enjoy the ease of access that exposed turrets offer. Unlike exposed turrets, capped turrets offer a screw on cap that protects the turret from rotating unexpectedly. These turrets are ideal for the marksmen who do not want unintended changes to their elevation and windage settings. Turrets can be cumbersome because they can take time to unscrew when you do need to make modifications to your windage and elevation. Also, there have been stories of aftermarket caps that have caused the turrets to come out of the scope. This is one reason why it is important to consult with your manufacturer before installing aftermarket modifications. Key turrets offer a little more protection than exposed and cap turrets as they require a tool like an Allen wrench or screwdriver to adjust the turret. A key turrets system would be ideal for the marksmen who typically shoots under similar conditions. Competition shooters and range only shooters will enjoy a key turrets system because the zero will never change. Ballistic turrets are typically oversize components that sit on top of the elevation turret. A ballistic turret will have distance markings on it in 100-yard increments. The distance markings are for easy reference of the shooter and simple use. The ballistic turret enables the shooter to compensate for bullet drop from known distances. One advantage of the ballistic turret is that it allows for multiple zeros and on-the-fly adjustment. Ballistic turrets also allow for the tactical shooter to take holdover and bullet drop out of the equation making it easier to stay on target. While they do require added set up and they are more expensive than conventional rifle scopes; many people find that a ballistic turret is very enjoyable once they get used to shooting with it. In addition to all of the turrets listed many aftermarket manufacturers offer custom turrets for the mainstream scope manufacturers. You can get speed dial, Hunter, military and tall knob aftermarket adjustments. Just remember when making aftermarket modifications you may void warranties to your scope. As long as the work is backed up by the craftsman when they modify your scope, there should be nothing to worry about. There are many things that you can consider when looking at turret systems for your scope. In the end, it will come down to your personal style of shooting as well as the needs you have when firing. Try out several styles of turret systems before you settle with one system. If you have friends that have exposed turret while others have key turrets ask them to use their scopes so you can get an idea of how these turret systems operate. Once you’re familiar with the turret systems, you will be able to choose which system is best for you.